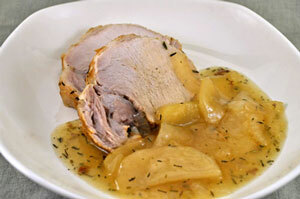 Thyme for Cooking Menus: Roast Pork with Apples and Onions, easy recipes. We use a bit of apple juice during the winter so, I buy a 6-pack of small juice boxes to have on hand. Each one is about 8oz. Leftover pork is used in the Hash. Apples are traditional with pork, and the flavors, obviously, work well. Calvados is apple brandy but regular brandy or white wine will work. We use a bit of apple juice during the winter so, I buy a 6-pack of small juices to have on hand. Each one is about 8oz. In heavy pot or oven with tight-fitting lid, brown pork in olive oil for about 10 minutes. After turning pork, add sliced onions around the side. Add Calvados, juice, stock and herbs, turn heat to low, cover and braise for 45 minutes. Peel apple, cut into quarters and cut out core. Cut each quarter into 3 or 4 slices and add to onions. Cover pork and cook for 30 - 40 minutes longer or until done. Pork is done at an internal temperature of 145F (62C). If you don't have a thermometer, cut a slit in the center and look, slightly pink is okay. Remove pork, onions and apples to a platter, cover to keep warm. Turn heat up under pot, dissolve cornstarch in juice and stir into pan to thicken. Slice pork and serve, sauce on the side. 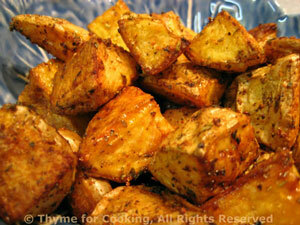 Lovely golden brown and crisp, these potatoes are great with any meats any time. They are easy to make and the herbes can be varied according to the rest of the meal. In summer we do them on the barbecue grill in an old metal pie plate for the same amount of time.. Put remaining ingredients into large bowl and mix well. Add potatoes and toss, coating thoroughly. Arrange potatoes on baking sheet with rim (I use my trusty, round pizza pan) Bake at 400F for 30 minutes. You can turn once if you like to fuss but I usually don't bother. Remove from oven and serve. These will stay hot for awhile so a 5 or 10 minute delay is okay. The sweetness of the carrots pairs perfectly with the richness of the Balsamic vinegar. Peel carrots and roll cut: cut the end off of the carrot at an angle, roll carrot 1/4 turn and cut next piece about 3/4 inch away at an angle, roll 1/4 and cut next piece, etc. This gives you interesting looking pieces with lots of surface. Put carrots and stock into a small saucepan or nonstick skillet. Bring to a simmer over medium heat. Reduce heat, cover and let simmer until done, 10 - 15 minutes. 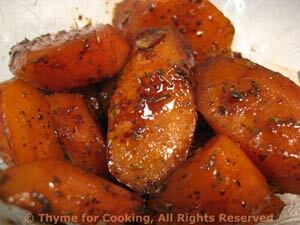 Remove carrots from pan and add garlic and thyme. Increase heat and reduce liquid to about 1 tbs. Add vinegar, stir well to combine. Return carrots to pan, stir well and cook for 2 minutes longer. Serve.